Summer Dessert: Buttermilk Peach Pound Cake Recipe / Hey, EEP! Currently wrapping up this beauty to give to our editor for her birthday. It's a buttermilk-peach pound cake. I love making this cake, especially with buttermilk because it always comes out a little tangy and sticky—mmm! But I decided to make this cake for her because: (1.) the peaches in the Fort Greene farmers' market have been super juicy and fabulous, and peaches and buttermilk make great friends (2.) I found this girlie paper tube pan and my heart melts for almost all gift packaging supplies. Fingers crossed she likes it! 1. Make the cake: Preheat the oven to 325˚. Lightly butter a tube pan and place it on a baking sheet; set aside. Beat the butter and sugar with a mixer on medium speed until light and fluffy. Beat in the eggs and egg yolk, one at a time, beating between each addition. Add the vanilla and lemon zest, if using. 2. Whisk the flour, baking soda and salt in a bowl. Beat the flour mixture into the butter mixture, alternating with the buttermilk, in three additions, scraping down the bowl as needed. Pour the batter into the prepared pan and top with the peaches. 3. Bake until the cake pulls away from the sides of the pan and a toothpick comes out clean, about 1 hour, 30 minutes. Let cool on the baking sheet 5 minutes, then transfer the pan to a rack and cool completely. 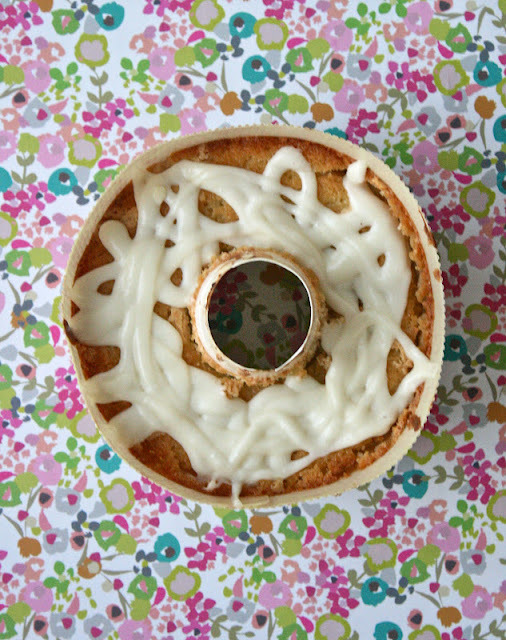 Run a knife along the sides of the pan to loose, then turn out onto a cake plate. 4. Make the glaze: Whisk the cream cheese, confectioners' sugar, milk and vanilla in a bowl until smooth (add more milk and/or confectioners' sugar to reach your desired consistency). Drizzle over the cooled cake. Let sit 15 minutes until set.